Get all of the performance that your engine can produce with these durable pushrods designed especially for high-lift cams. These Trick Flow® pushrods are 5/16 in. in diameters. They feature .080 in. wall thickness and are formed from 4130 chromemoly steel. 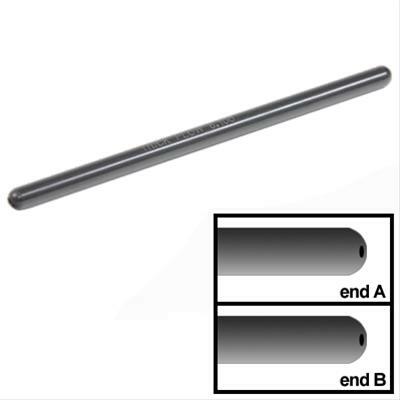 These one-piece Trick Flow® pushrods are heat-treated for use with guideplates. They close their tips, and then the oil holes are drilled and chamfered to .093 in. to prevent stress fractures and cracks. Pushrod Tube Diameter -- 5/16 in. Intake Overall Length (in) -- 7.425 in. Exhaust Overall Length (in) -- 7.425 in. Top Tip Diameter -- 5/16 in. Bottom Tip Diameter -- 5/16 in. Wall Thickness (in) -- 0.080 in.